The Loyalty Shop is a way for our players to earn select items, in a sense a loyalty shop. Players are able to earn Eternal Coins by being online and can then spend them in the Loyalty Shop to get items. Where is the Loyalty Shop and How do I check my Eternal Coins? 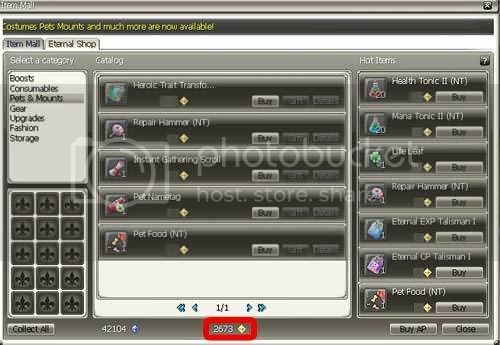 To open the Loyalty Shop simply open the Item Mall window (shortcut: I key on your keyboard) and click the Loyalty Shop tab at the top. Items shown may or may not be in the current Loyalty Shop. Players can check their Eternal Coins on the Loyalty Shop window. Eternal Coins are located to the right of your Aeria Points. I’ve outlined the Eternal Coins in the screenshot above. How do I get Eternal Coins? To receive Eternal Coins players must visit Service Officer Assistant Goth located in Aven at X345 Y263 in the City Hall area. Speaking to Goth will allow you to receive an Eternal Chest, once per 2 hour period of online time. Opening the Eternal Chest will give you Eternal Coins which can be used to add Eternal Points to your Loyalty Shop. 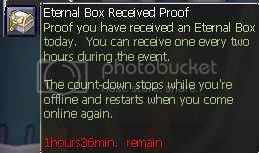 How often can I receive Eternal Chests? Players must wait 2 hours between claiming Eternal Chests. The counter will only count down if you are online. So if you have 1 hour 30 minutes left and log off you will still have 1 hour and 30 minutes left when you log back on. The following buff will appear to let you check how long you have left before you can claim the Eternal Chest again.